“Stock Market Astrology & Astrological Theory of Business Cycles” is the first ever systematic work on the astrological influences on stock markets and the stock prices, based on 11 years of aggressive research carried out with the wisdom gained through 20 years of professional experience in the field of astrology. There has been a persistent demand for some dependable method of predicting the stock markets with greater accuracy and this book will hopefully fill that gap successfully. The language of the book is simple and the complex astrological principles were also explained in a very simple manner that anyone, with little knowledge of astrology, can easily grasp these principles to predict the business cycles, periods of economic recession, panic and the direction of the stock prices successfully and use them accordingly for trading in the stock markets. The fundamental idea behind this book was that the Stock Markets are governed by the investor sentiments of greed and fear and the fact remains true that all the human sentiments, whether the sentiment of greed or fear, are governed by the astrological influences on the human brains, which drives the brain to take any buying or selling decision in the markets. This book explains the implications of all the planetary transits alongwith the transit of the Moon through each of the 27 Nakshatras are explained with real examples of intraday trading. Influence of any particular planet gets intensified during certain particular hours of a day. Method for timing the price movements is explained in the book . The Intraday, Short Term and Long Term price movement in the stock prices for 30 different sectors of the market is explained in the chapter ‘SECTOR WISE PREDICTING THE INTRADAY, SHORT TERM & LONG TERM MARKET OUTLOOK’. The chapter ‘ASTROLOGICAL ANALYSIS OF GOLD PRICE CYCLES’ explains the principle for determining the movements in Gold prices. And the chapter ‘ASTROLOGICAL ANALYSIS OF CRUDE OIL PRICE CYCLES’ explains about the principle for determining the movements in Crude Oil prices. Stock Markets are often influenced by the Business Cycles and it has been a challenge for a long time to successfully predict the occurrence of any Business cycle in advance. 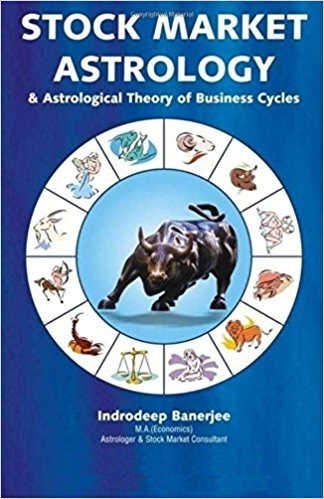 For the first time the relationship between the astrological phenomenon and the Business Cycles has been successfully established which is thoroughly explained in the chapter ‘ASTROLOGICAL THEORY OF BUSINESS CYCLES’. The authenticity of this principle has been established with the help of historical evidences discussed in the chapter ‘HISTORICAL EVIDENCES OF MAJOR ECONOMIC RECESSIONS, INCLUDING GREAT DEPRESSION OF 1930 AD & SUBPRIME MORTGAGE CRISIS OF 2008 AD; CONFIRMING THE ASTROLOGICAL THEORY OF BUSINESS CYCLES’. The prediction for the forthcoming periods of economic recessions has also been made for the help of the readers, in the chapter ‘WATCHOUT LIST OF FORTHCOMING COMBINATIONS FOR ECONOMIC RECESSIONS AS PER ASTROLOGICAL THEORY OF BUSINESS CYCLES’. This book also explains the principle of Sun Spot Theory of Business Cycle in the chapter ‘SUN SPOT THEORY OF BUSINESS CYCLE’. Various other astrological periodicities helpful in determining the Business Cycles were also discussed in the chapter ‘ASTROLOGICAL PERIODICITIES IN BUSINESS CYCLES’.